Therefore, cost cutting exercises are inevitable as new projects are shelved, existing ones put on hold and businesses reduce volumes. Unfortunately, in testing times like these, many companies are contemplating redundancies or staff reductions. Reducing the workforce has never been a pleasant task. Having said that, redundancies can be much more unpleasant if not properly planned and implemented. Bad practices can expose the company to disputes, litigation and consequently damages in terms of money and goodwill. Does the UAE Labour Laws permit an employer to terminate an employment contract because of financial distress? Federal Law Number 8 of 1980 of the UAE, as amended (the “Labour Law”) sets out the principals governing employment law in the UAE. Article 113 of the Labour Law provides that: “A contract of employment shall terminate in any of the following cases: If both parties agree to its termination, on condition that the workers’ consent is given in writing; On the expiry of the period prescribed in the contract, unless the contract is expressly or tacitly extended in accordance with the provision of this Law; If either of the parties of a contract concluded for an unlimited period, expresses his intention to terminate the contract, provided that the provisions of the Law regarding the period of notice are observed and on the grounds accepted for the non-arbitrary termination of the contract. Thereafter, the Labour Law proceeds to make a distinction between limited and non-limited term employment contracts. In respect of limited term contracts Article 115 provides that if the same has been terminated by the employer prior to its expiry for any reasons other than stipulated in Article 120 (which are reasons for misconduct, negligence, etc.) then the employer is required to compensate the employee up to three months of his remuneration or the remaining period of contract, whichever is less. However, in the case of unlimited term contract Article 117 stipulates that any party can terminate the contract for a valid reason and a minimum notice of 30 days to the other party. The question is whether financial hardship will be considered as valid reason? There is no answer to this question in the Labour Law and therefore it remains uncertain. The employee may argue using Article 122 of the Labour Law which provides that employee’s contract shall be deemed to be arbitrarily terminated if the reason for termination has no nexus to his work. Under this line of argument any termination which is not a result of employee’s poor or non performance of the work will qualify as arbitrary termination. On the other hand, in a number of decisions, the Dubai courts have upheld that the employer, as a result of economic and financial downturn, can lower his costs by downsizing his workforce if it appears to him that the economic and financial downturn will affect him adversely and failure to downsize will adversely affect him. It has been found in the past that such termination of employees, as a result of downsizing, will not constitute arbitrary termination under the meaning of the Labour Law. However, the determination of the necessity to downsize the organisation and this discretion of the employer is always subject to the control and discretion of the UAE courts. It is unclear though which indicators the court will use to determine whether downsizing is necessary or not. As downsizing is generally a preventive measure i.e. prior to actual effects of the crisis. Will the courts accept business forecasts and market indicators as elements to consider? From the above rulings it is clear that the courts in the UAE will definitely come to the rescue of the falling and shrinking businesses, however, at the same time safeguarding the job of the genuine employees and restricting the employers from taking the benefit of the downturn to cut the jobs arbitrarily. In case it is held that the reason for termination is arbitrary and not for a valid reason the courts in the UAE may order the employer to pay a compensation which shall not exceed employee’s three months of remuneration. Some employers may adopt different tactics to reduce their liabilities by first decreasing the salary of the employees citing the crisis where employees have less choice but to accept the same. 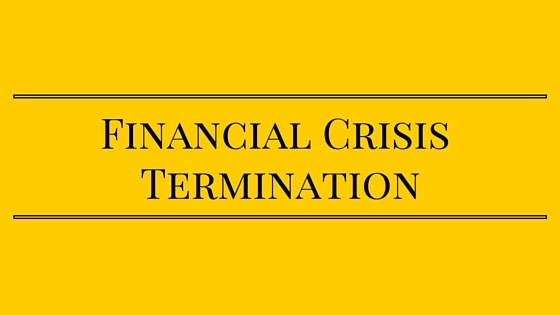 After a month or two the employees are terminated thereby reducing the liability of paying end of service benefits to the employee (as it is calculated based on the last salary drawn). The courts are yet to rule of such cases and put some preventive measures for the employees to have some solace. Some of the rational employers feel that offering some compensation to the employee for being made redundant and mutually agree to part ways will be beneficial in order to avoid unnecessary hassles of an employee filing a case with the labour department and subsequently to the courts. In long term this shall prove to be prudent as and when the economy recovers and the need of hiring the experienced workforce resumes. It also restricts, to a certain extent, the generation of negative reputation about the employer. It appears that each matter will be dealt by the courts in the UAE in their discretion on case by case basis rather than allowing termination of the employee in employer’s discretion, provided however, the employees challenge such termination in the court and court feels the need to investigate.